If you are looking for the healthiest and the most convenient contact lenses in the market, then you will benefit from buying the 1 day Acuvue moist 90 pack contact lenses. 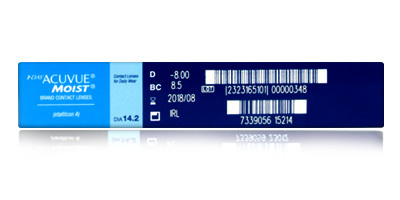 The unique features boasted by the 1 day Acuvue moist 90 pack contact lenses include etafilcon and L	ACERON technology. They have been proven to contain the best moisture content in the market. These contact lenses from Johnson and Johnson take the entire lens using experience to a new level. There is no hassle in wearing, using, removing and disposing off these lenses. They fit seamlessly into your busy schedule. 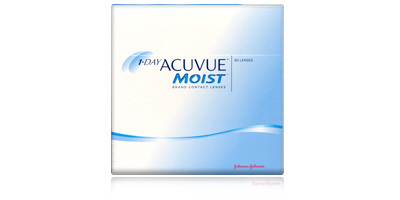 The 1 day Acuvue moist 90 pack contact lenses constitute soft, precision crafted, moist, UV blocking lenses. Their water content of 55% ensures sufficient hydration to your eyes. They also come with a convenient tint to help you locate them. We offer you authentic 1 day Acuvue moist 90 pack contact lenses at incredible prices, sourced direct from the manufacturers. Our diligent ordering process includes instant processing and quick delivery. Get the unique comfort of 1 day Acuvue moist 90 pack contact lenses and start saving today.